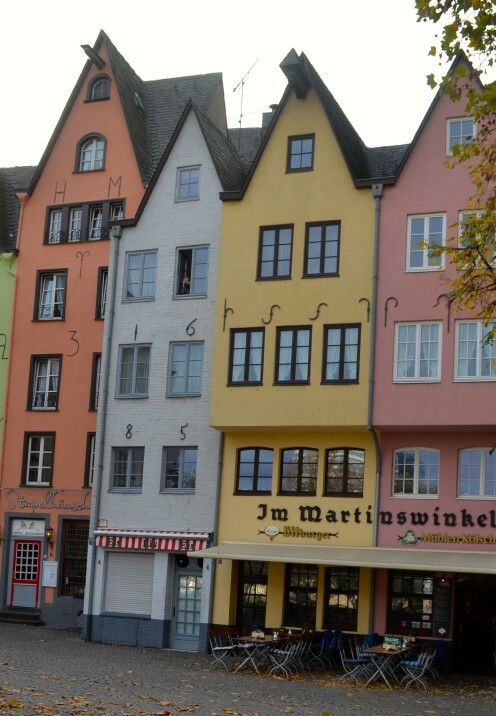 Greetings from Cologne, Germany, the first port of call on our Uniworld Riverboat Cruise down the Rhine River. 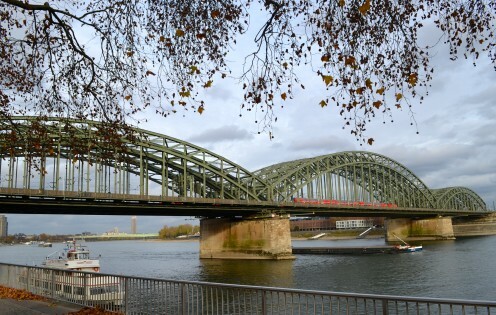 Located on both sides of the river, Cologne is Germany’s 4th largest city with over 3 million residents. Our ship pulled up right into the heart of the old town, just a short walk away from all of the primary points of interest. (By the way, that’s not our ship in the photo below.) So today we’re going to be exploring Cologne Germany. I’m going to mention right off that Cologne was probably my least favorite city that we visited on this trip to Europe (But I’m going to show you the pretty stuff so please don’t leave!). I think that my feelings about the city were probably influenced by the fact that Cologne, for the most part, is a new city. That’s because it was one of the most heavily bombed cities during World War II, and it was was almost completely destroyed. 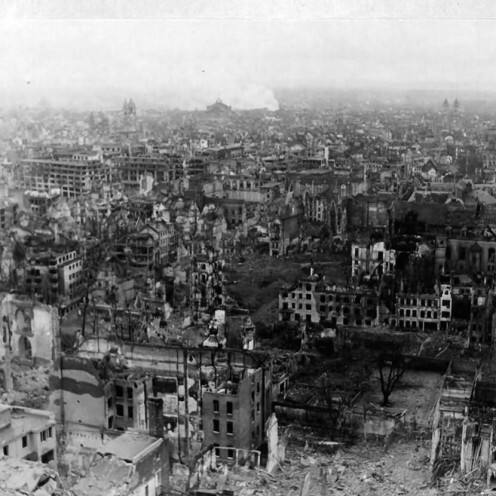 The United Kingdom’s Royal Air Force alone dropped almost 35,000 tons of bombs on the city. 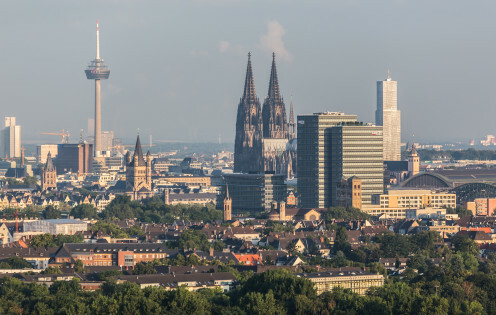 After the war, Germany did restore many of Cologne’s historic buildings but, in general, postwar rebuilding left the Cologne cityscape a mixed bag of some restored old and a lot of new. But when I go to Europe I go for the antiquity. I like to see the old & ancient, not modern cities that are a dime a dozen here in America. 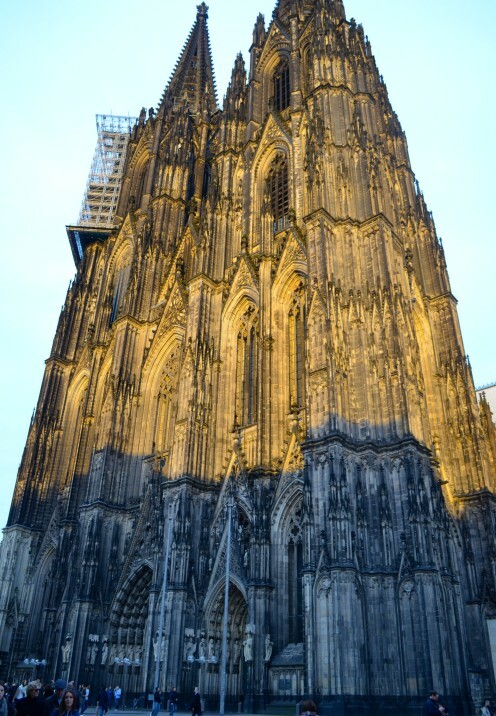 The most impressive building in Cologne and its most famous landmark for centuries is the Cathedral, a UNESCO World Heritage Site and the city’s second tallest structure. Once the tallest building in the world, it is now dwarfed only by the telecommunications tower that you can see in the photo above. 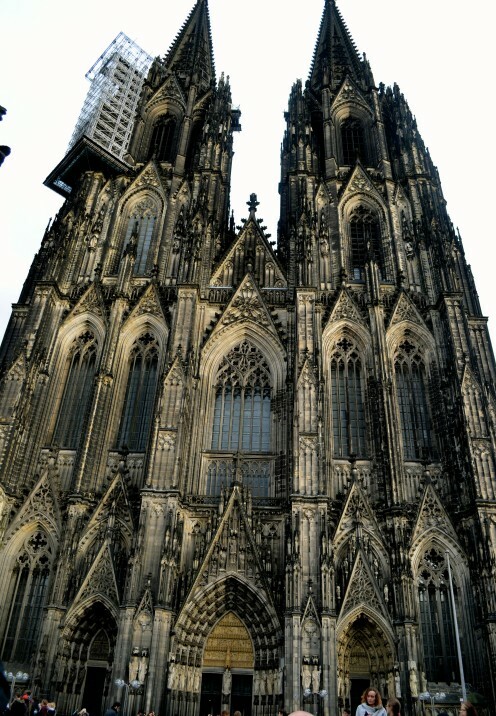 Cologne’s Cathedral is the greatest Gothic cathedral in Germany and boasts the world’s largest church façade. Due to the ravages of pollution, wind, and rain which slowly eats away at the stones, it is in a perpetual state of repair and cleaning, thus the presence of the scaffolding you see in my photo below. 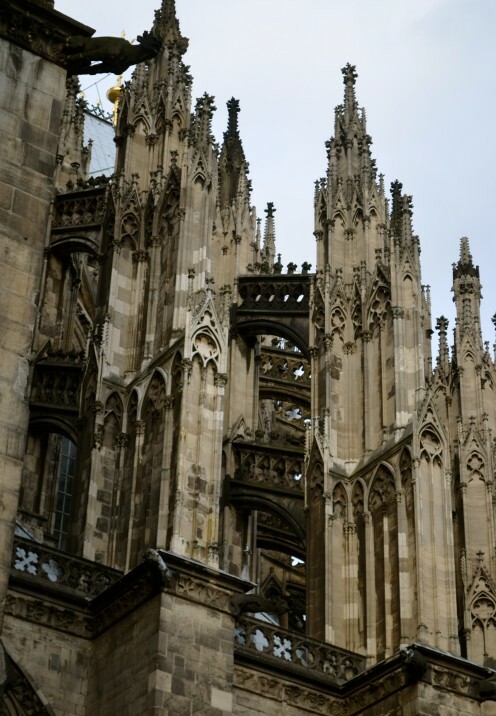 Our city guide explained that the cathedral took 14 hits from aerial bombardments during the war, but continued to stand tall in a city otherwise virtually flattened. 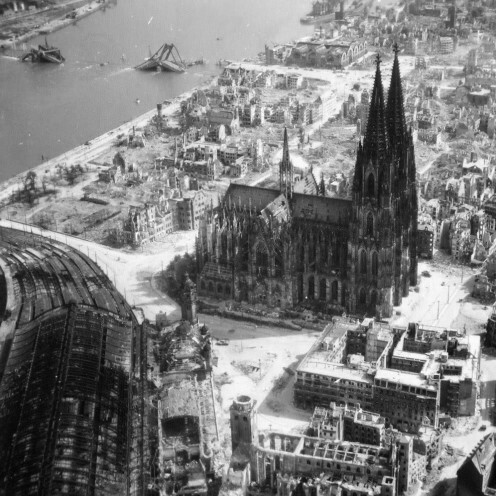 Apparently Allied aircraft used the Cathedral as a navigational landmark, which is likely the reason it was spared. 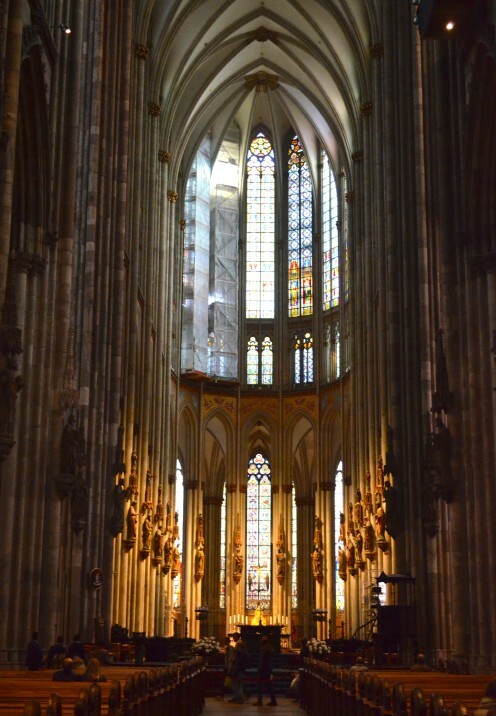 Cologne Cathedral (Kölner Dom) is dedicated to the saints Peter and Mary and is the seat of the Catholic Archbishop of Cologne. 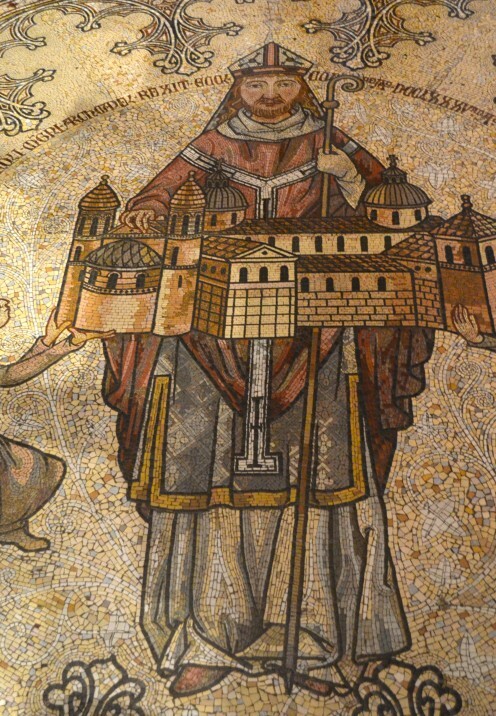 In fact, do you know why a Cathedral is called a “Cathedral” and not simply a Church? A Cathedral is the principal church of a diocese, and is the church to which the bishop is officially associated. 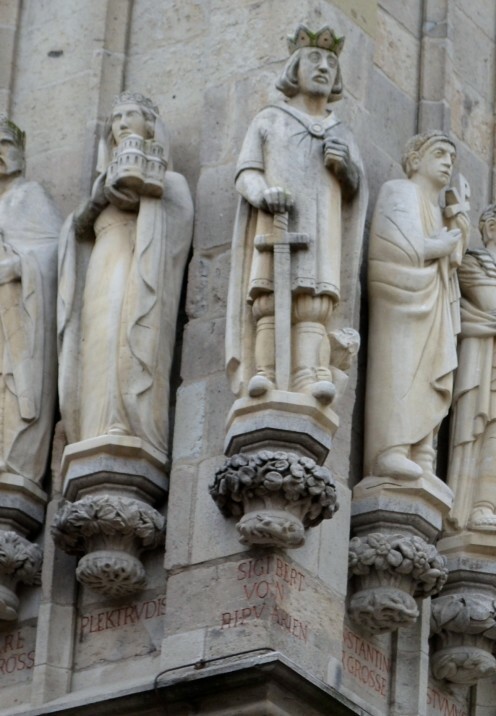 But what makes this Cathedral extra special is the fact that it houses what is claimed to be the remains of the Three Wise Men. 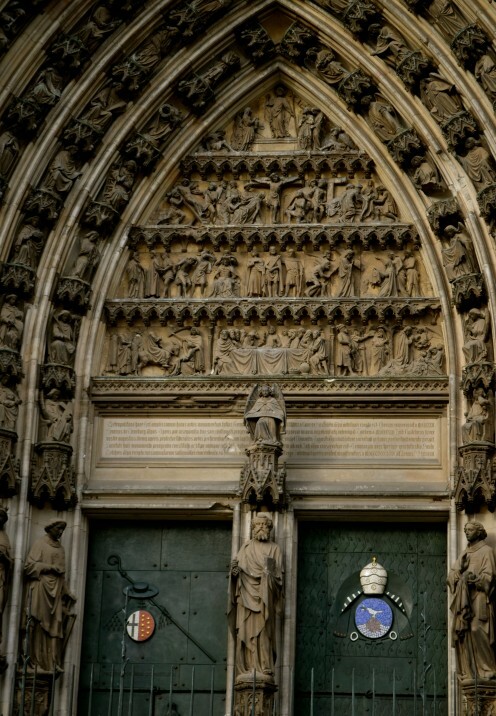 Because of these relics, this Roman Catholic Cathedral became one of the most important places of pilgrimage in Europe. 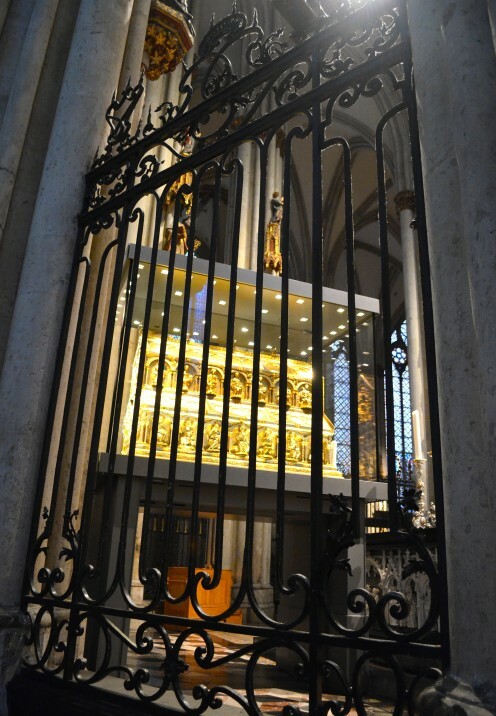 Encased in a beautiful golden shrine, the relics were brought to Cologne from Milan in 1164. 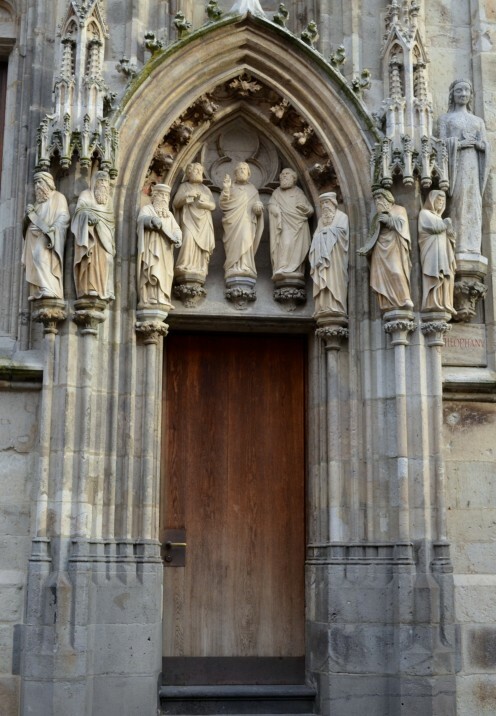 Known as the Shrine of the Magi, it is the largest, most artistically significant relic of the Middle Ages. The “Magi” were the “wise men from the East” who came to adore Jesus in Bethlehem. 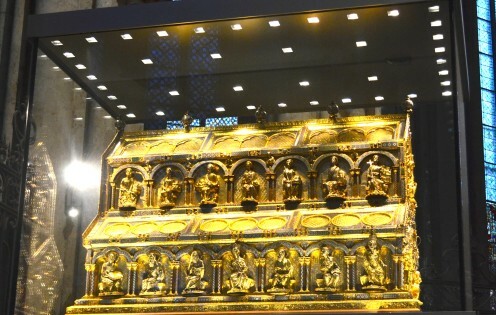 Inside, the reliquary holds three golden-crowned skulls believed to belong to the Three Magi. Another important relic in the Cathedral is the statue of the Virgin Mary. This baroque statue, which dates back to the 17th century, is dressed in a silk gown with only the heads of Mary & Jesus exposed. 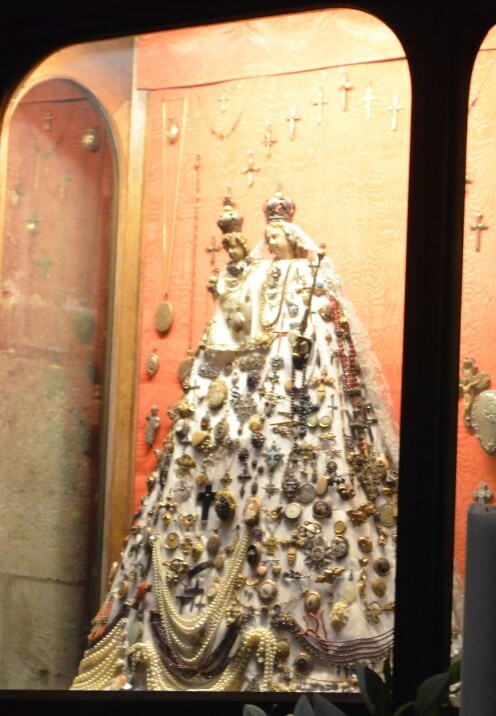 It is known as the miracle-working Jeweled Madonna. 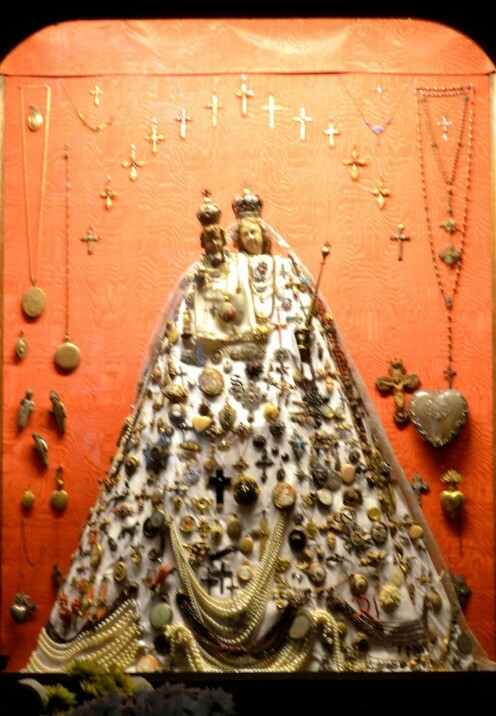 Pilgrims and worshippers have pinned the dress with jewelry and other offerings which are given in gratitude or devotion. 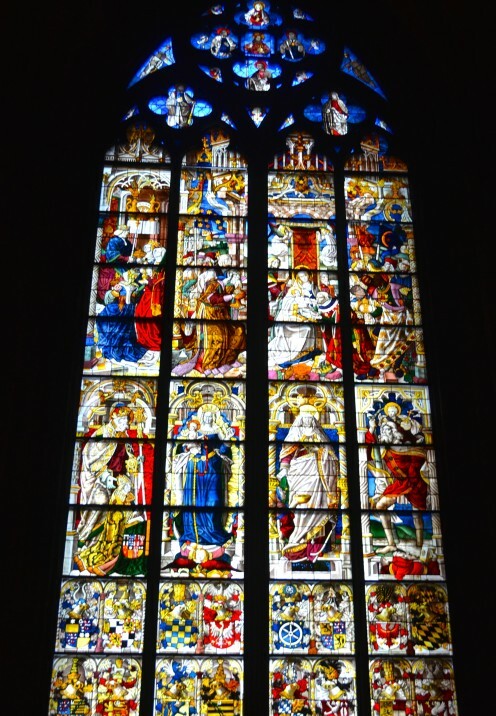 Cologne Cathedral is also known for its outstanding stained-glass windows. This window, known as the Adoration of the Magi, shows the 3 Wise Men as they appeared before Mary and Child with their offering of gifts. In addition to the beautiful windows, much of the flooring within the cathedral are beautiful ceramic mosaic works of art. This one was made by Villeroy & Boch. 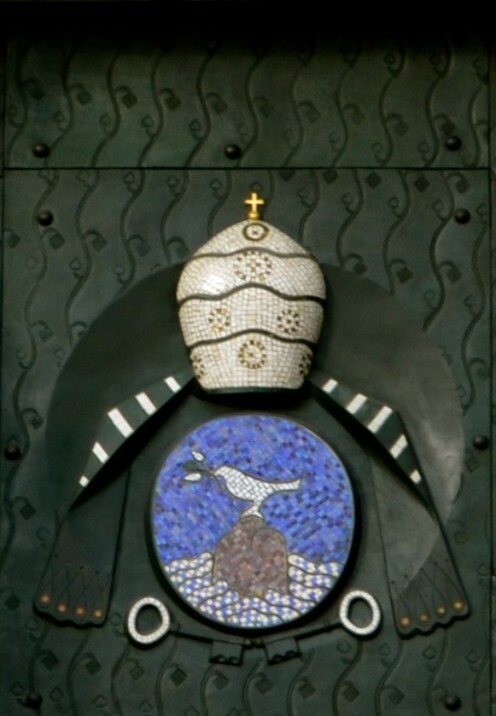 Exiting the Cathedral I found more beautiful mosaics adorning an elaborately decorated pair of doors. 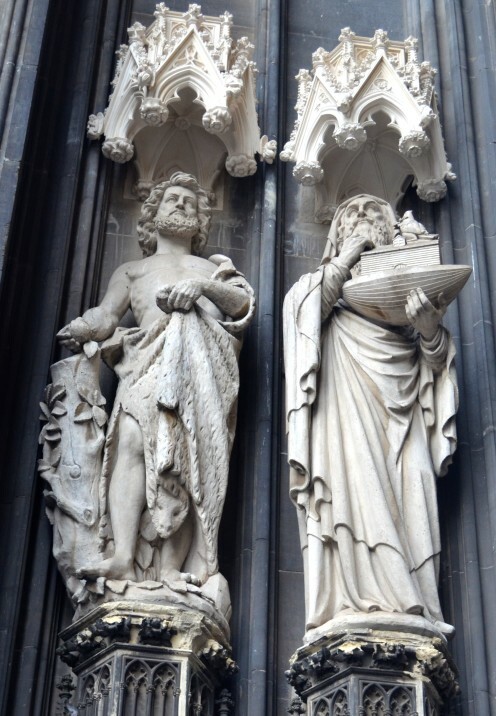 And intricately carved statues also adorn the facade of Cologne Cathedral. 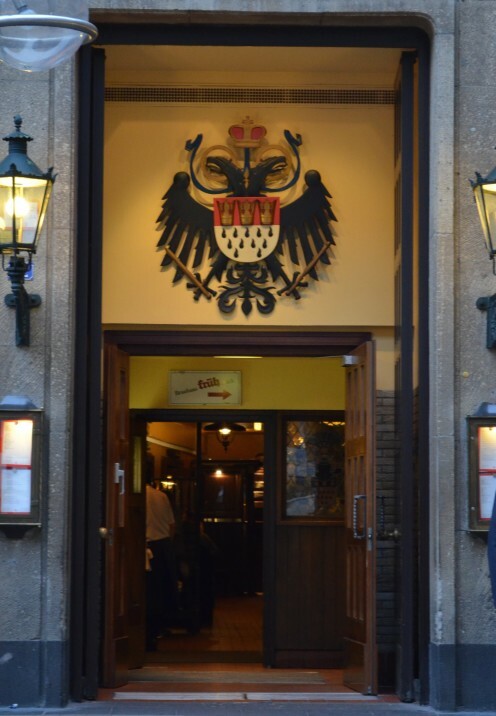 So, now that we’re outside, let’s explore the area surrounding the cathedral: first stop, a Brauhaus. 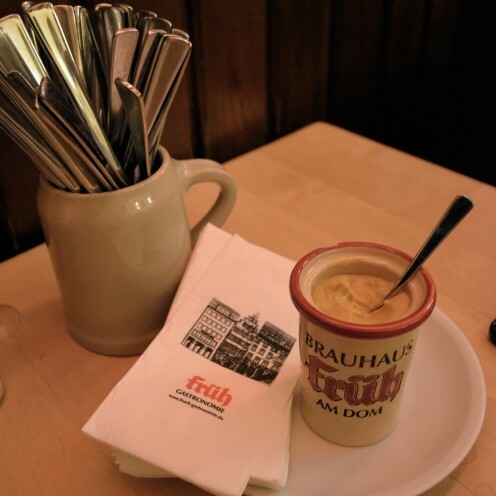 A Brauhaus is the combination of a brewery and an affiliated restaurant that mainly serves the brewery’s own beer. 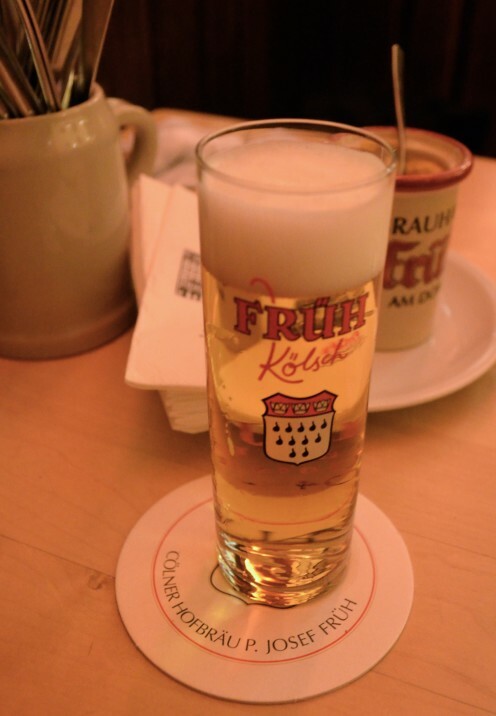 This one is called Brauhaus Früh. 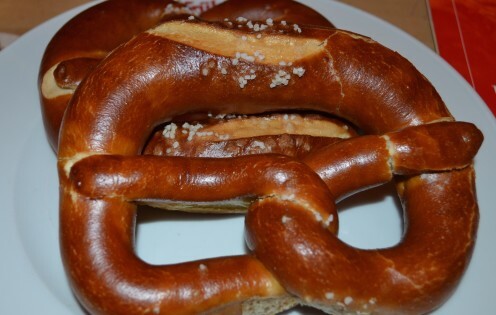 Although I’m not an aficionado of beer, one cannot come to Germany and not partake in a glass or two, especially if it’s accompanied by pretzels and mustard. 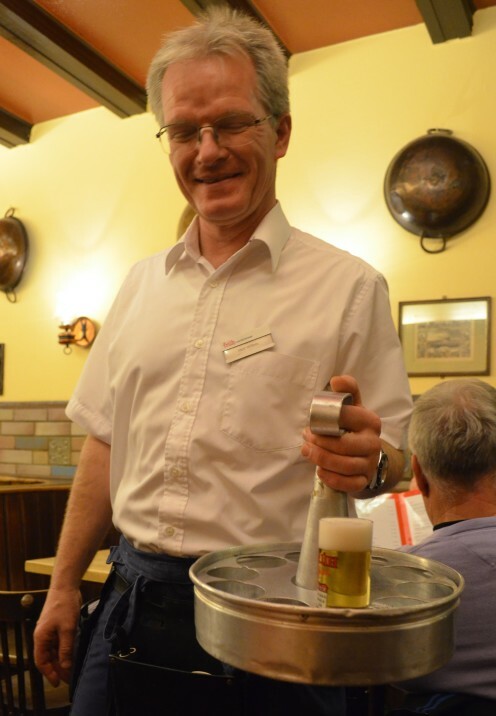 Here the waiters circulate the restaurant with their caddies of beer, freshly poured into small glasses. If you leave your glass empty without covering it with a coaster, the waiter will automatically leave you with another glass. After fortifying ourselves with beer and fresh pretzels, it was time to continue our walking tour. 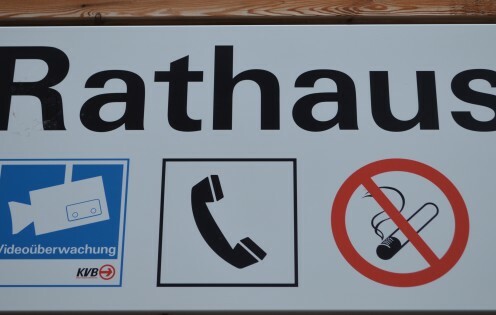 Next stop, the City Hall, or Rathaus (Rat House) in German. It’s certainly an unusual name to English speakers. 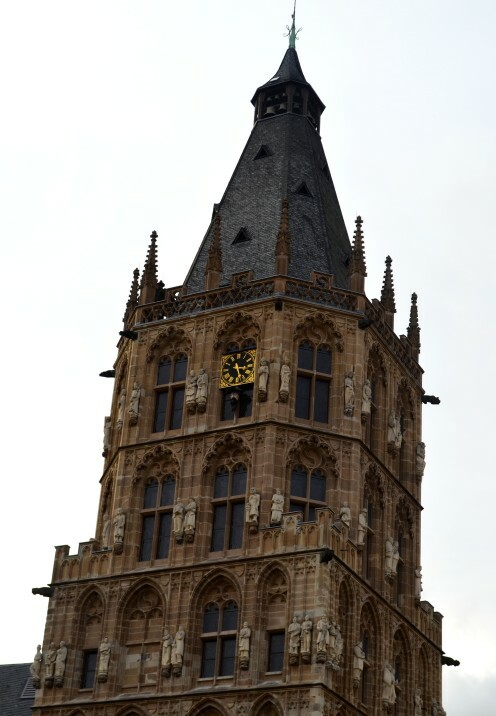 Located in the heart of the old town, the Rathause’s Gothic tower is crowned by a clock with a very curious feature. 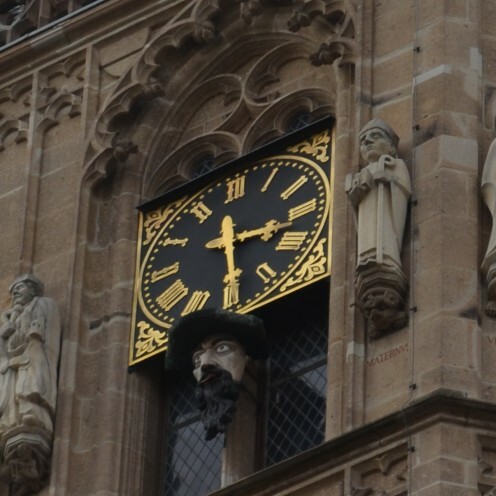 Called the “Platzjabbeck”, it’s a grotesque looking wooden face that opens its mouth and sticks out its tongue when the tower clock strikes the hour. See it there on the top left side of the photo below? As you can see, we were there on the half hour so, unfortunately, we did not get to see his famous red tongue. In addition to the funny clock, the City Hall is also decorated with more than one hundred and twenty sculptures. 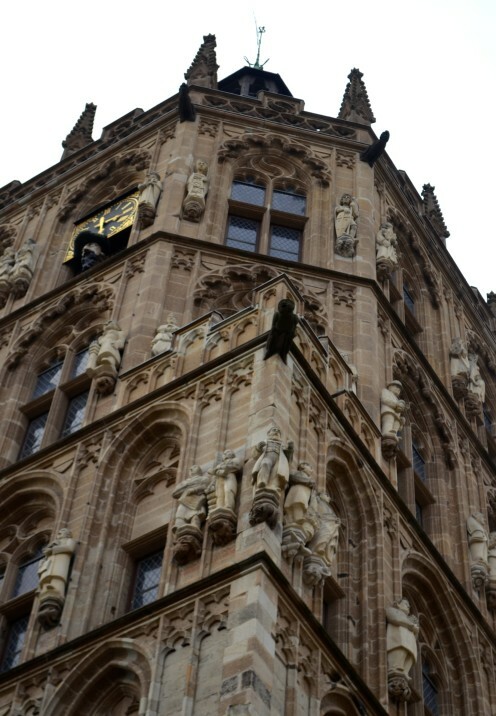 The beautiful sculptures depict Christ, his apostles, saints and a host of figures that made an impact on the history of Cologne over a span of two thousand years. 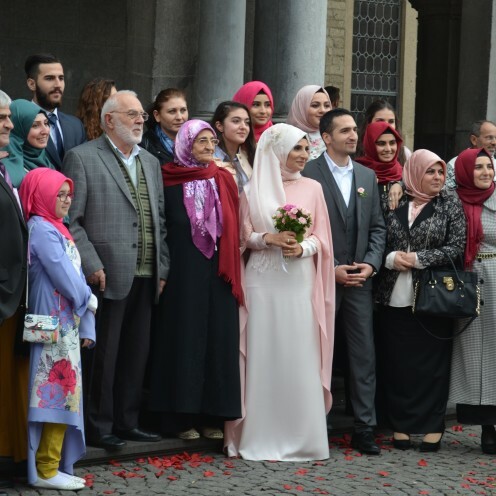 The day we visited, it was also the venue for a very picturesque wedding of what our guide believed were Turkish immigrants. Her funny getaway vehicle was parked alongside. 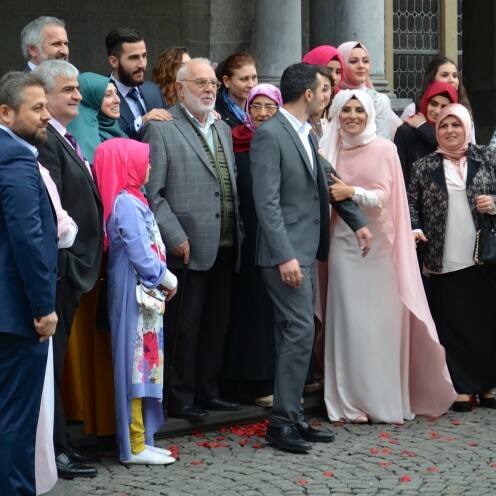 Of course, the most famous thing about Cologne is that it is the origin of “Eau de Cologne”, a spirit-citrus based perfume launched in Cologne in 1709 by Giovanni Maria Farina, an Italian perfume maker. He named his fragrance Eau de Cologne, in honour of his new hometown, Cologne, Germany. 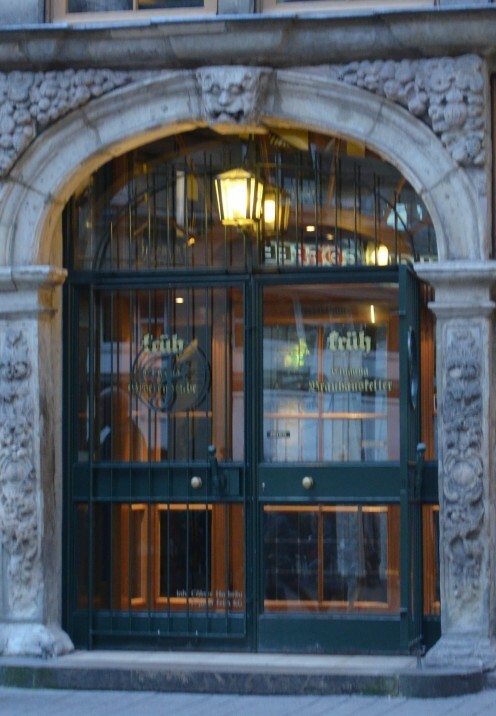 The original Farina establishment is still in operation in Cologne, and is the world’s oldest fragrance company. 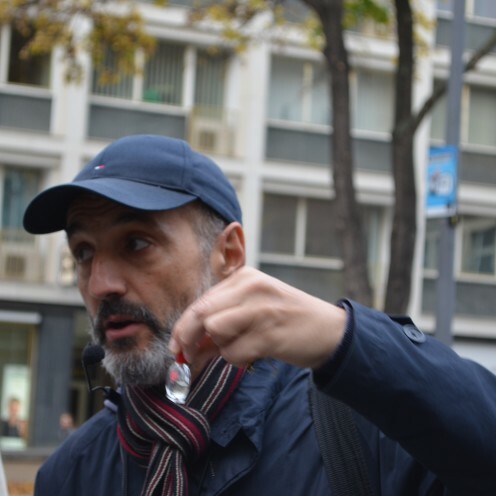 Our tour guide passed around a small bottle of Farina Cologne for us to smell. 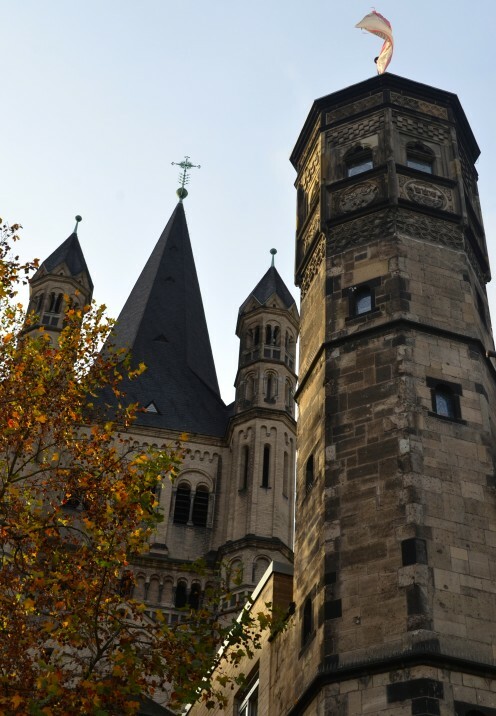 As we continued our walk through Old Town Cologne, we encountered several other lovely buildings, including The Great Saint Martin Church, a Romanesque Catholic church. 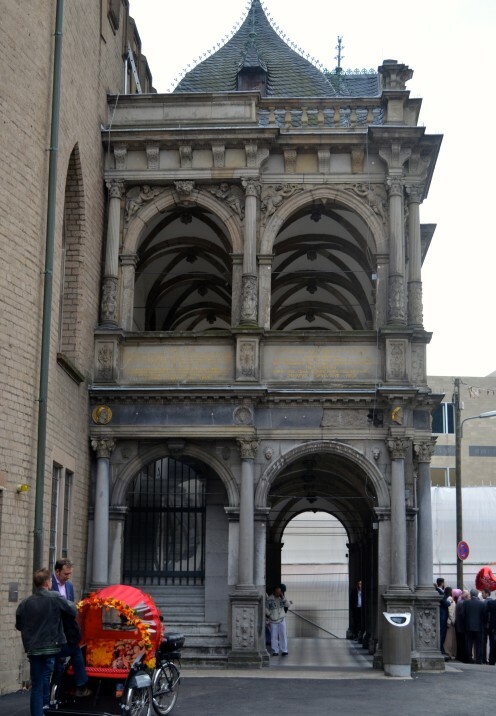 Its foundation (circa 960 AD) rests on remnants of a Roman chapel, built on what was then an island in the Rhine River. The church was later converted into a Benedictine monastery. We also strolled past these colorful historical houses. 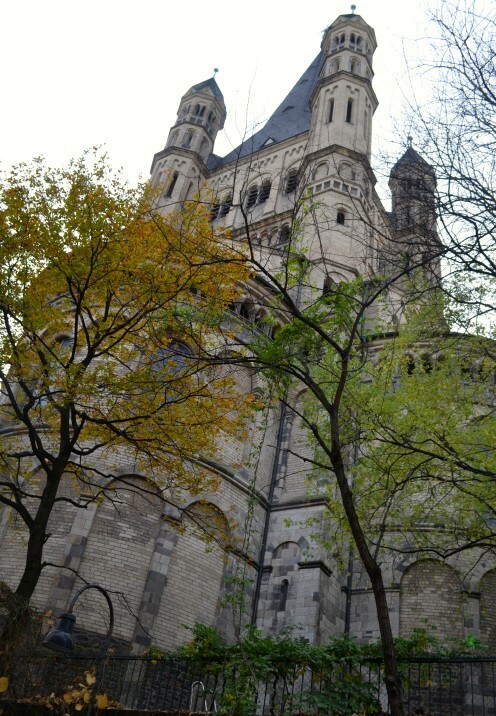 Finally the sun was beginning to set and, as our walking tour exploring Cologne Germany concluded, I took one final photo of the Cathedral. It’s amazing how light and shadows can transform a place. 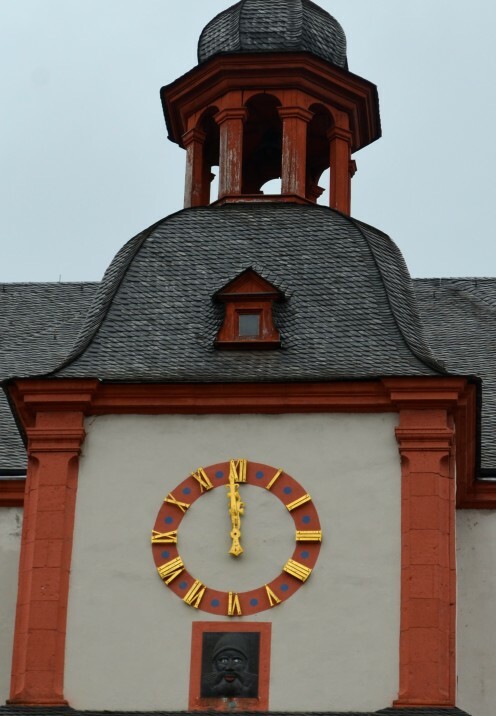 Please stay tuned and in my next travel post we will visit charming Koblenz, Germany where there is another funny clock tower. And this time we will get to see the red tongue!